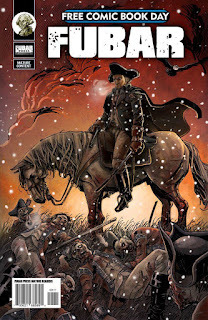 Mike Hawthorne: Free Comic Book Day FUBAR edition. Remember when I posted about the FUBAR cover I did for FCBD? Well, that was just the warm up colors for the solicitation. Here's the final cover as it will appear on the actual comic! Steve Becker and Jeff McComsey really out did themselves with this! They pour so much love into the FUBAR series, and I think you'll all appreciate it on Free Comic Book Day, May 4th! Make sure to look for this bad boy in stores! More info on FUBAR on their site. More info on FCBD on their site. Yeah, this one looks much better!